Mothers day all my life has been a day I pamper my mom. Get her fresh flowers she likes, make a greeting or buy one if I'm keeping busy, spend the day with her and the sort. Only after I had my baby 3 years ago did I realize what being a mother really is. And my respect for my own mother only increased ten folds. This mothers day, I was in for a surprise when Le Meridien invited me along with my son and husband to spend mothers day weekend at their Goa property - about which I have written here. 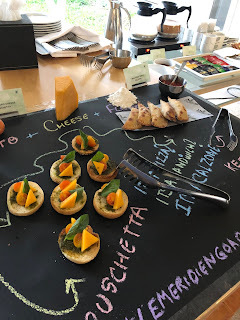 In this blog I am going to talk about how they made our stay very special! The awesome culinary wizards at Le Meridien Goa, Calangute set up high tea by the pool side, and the presentation was simply unique! All the food items broken down to their raw ingredients and presented - so that kids can know what's in the food they're eating. The samosas and chocochip cookie were the highlight for me. They were also sweet enough to send some to the room for the husband who was not feeling too well. Jazz & Grills is Le Meridien's and Goa's first "whiskey bar". The restaurant transforms you to another place with it's stage for live performances with the big screen, comfortable seating on two levels and a bar where you can sit if you prefer that. The decor has guitars and everything music too. We had our special set menu here and had such a great time with the great staff, awesome drinks and food! There was falafel in pita pockets, chicken burger, cottage cheese in thai green marinade, zatar spiced fish fingers. Also a special egg-bhurji that chef Saurav Chattoraj - that was the highlight for me. For drinks we had bourbon based drinks - one infused with honey another with apricots, both just amazing! For the kids there was french fries, roasted papad and juices - which kept them happy too! 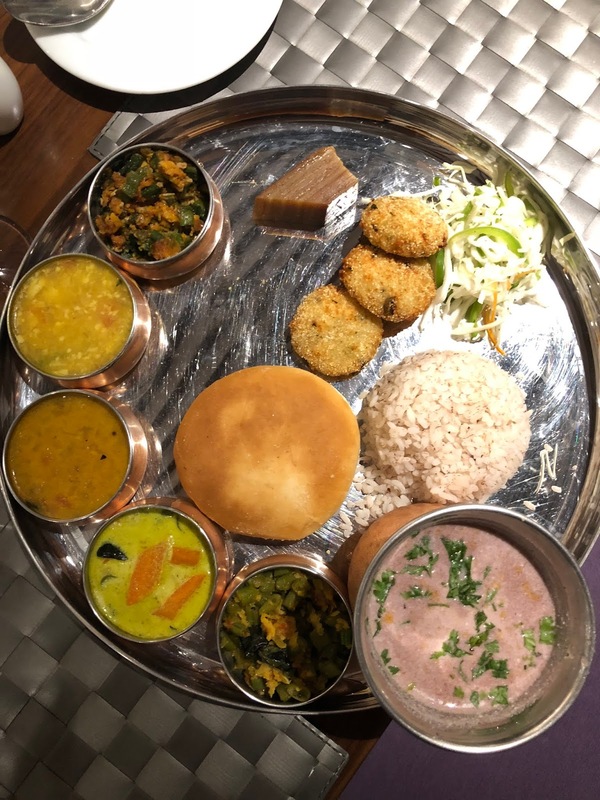 Latest recipe is Le Meridien Goa, Calangute's buffet restaurant and that is where we had our Mother's Day brunch. 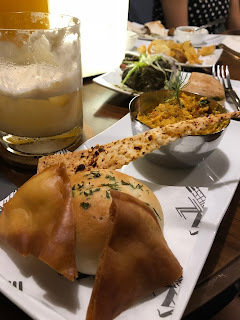 A wide spread to choose from - I went for their recommended soup of the day - khau suey - had that twice, also tried other things from the spread and then jumped to dessert - the stawberry pavlova was just amazing - light and fluffy. 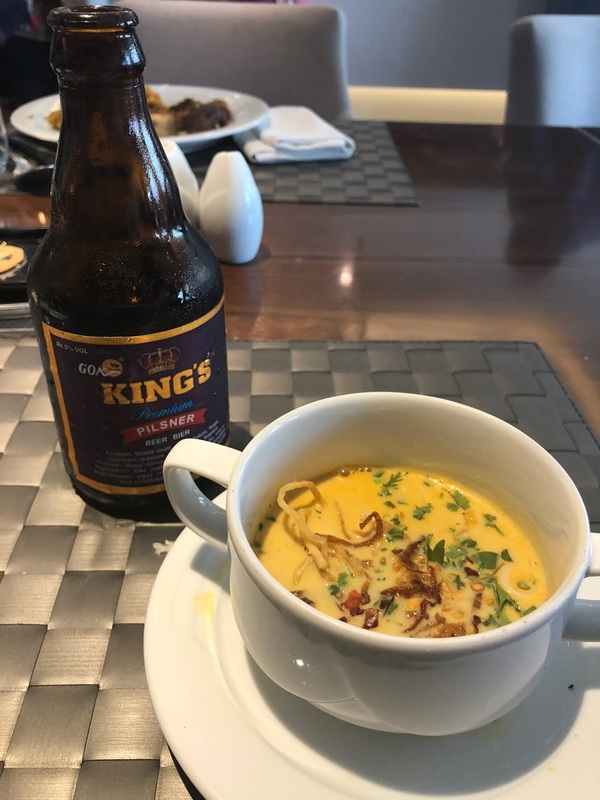 Kings beer was relished along with the food. There was a special activity set-up for kids where they could paint a Mother's Day card for mommies or have something painted on their face or hands. There were also lots of candies on display - jujubes, marshmallows and more - and the kids had a crazy time binging on them! For the second day dinner we experienced local goan delicacies, again at Latest Recipe - but this was a thali. Lot's of unique vegetables and curries, served with pav and breads and also the local dessert - bibinca. We also tried the chicken zacuti gravy which was amazing too. Again, with Kings beer, the goan local beer. 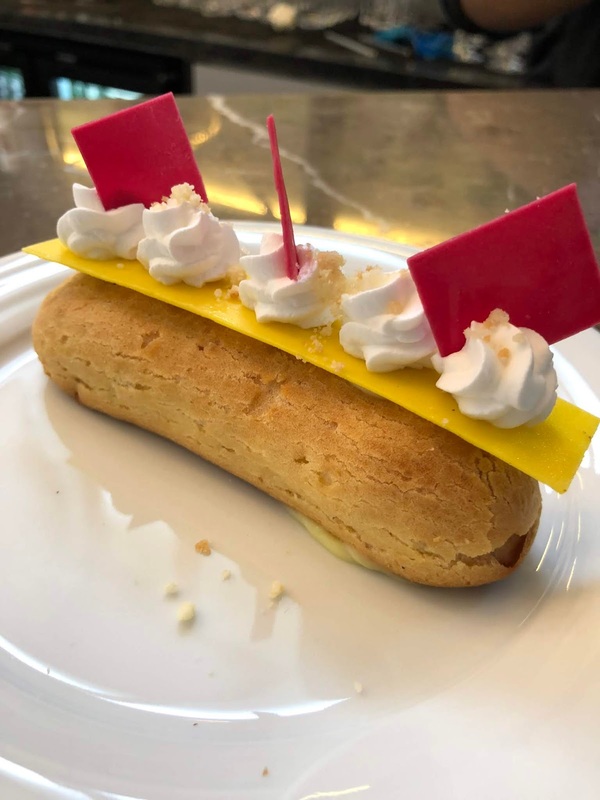 Every Le Meridien hotel has a signature dessert - The Eclair. And for each local hotel, they choose a third flavor (apart from Chocolate / Vanilla) that is known for it's local flavours. 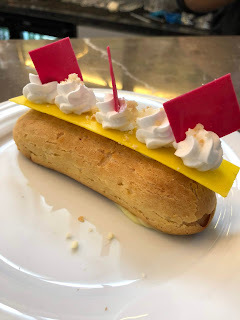 For Goa, it was mango and feni flavoured Eclair. Now just eating the dessert is so vanilla (pun intended), so they made us make our own eclair! It looks very easy, but isn't that easy. You have to make holes in the pastry to pipe in the cream all the way through - this is a real challenge. After that you decorate with cream, chocolate pieces and other garnishing and voila! Amazing and tasty! I felt absolutely pampered over the Mother's day weekend, and the kiddo felt quite special too! It was definitely a stay to remember - and we made some new friends too! Kaavya, our awesome host for the weekend, Kuheli, Pawan and their son Shreysht with whom my son Panav absolutely had a blast! Also Ruchi and husband and her adorable daughter Ivanka. How to book a tatkal ticket from IRCTC.